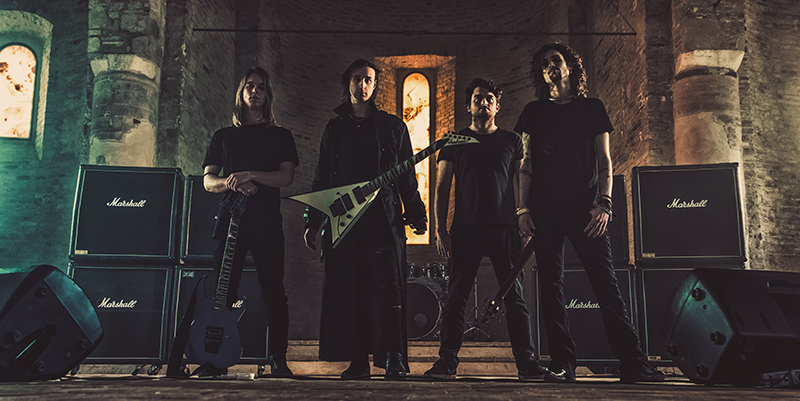 September 25th 2018 is the release date of “Fall Of The Divine”, the new Hell’s Crows video taken from their first album “Hell’s Crows” released on March 31st 2017 on Valery Recordslabel (www.valeryrecords.com), distributed by Audioglobe www.audioglobe.it/disk.php?code=8032642781605 and the best digital wordlwide stores. HELL’S CROWS, the Italian melodic-heavy metal band, in collaboration with CROWN METALBooking Agency (www.crownmetal.it) have been involved in the last year and a half around Italy in the promotion of their last studio work, often dividing the stage with colleagues of national and European fame such as PINO SCOTTO, SKW, NECRODEATH, TRICK OR TREAT, SKELETOON, SICK N ‘BEAUTIFUL, SOUNDSTORM, EAGLEHEART, STARSICK SYSTEM, SAWTHIS and many others. The video was directed by Studio Close Up (www.studiocloseup.it) and produced by Studio Close Up (www.studiocloseup.it) and Randy Rush. The press / promotional office is overseen by the V-PROMOTION Agency (www.v-promotion.com).